"The Ireland of 2009 has almost as many 'serious' poets as it does blocks of unsold apartments.â€‚What I love about John Corless's poetry is that instead of pretending to sit po-faced on the summit of Mount Parnassus, it goes absolutely in the opposite direction. Like Swift, Paul Durcan and Rita Ann Higgins before him, Corless takes the low road and shines the telltale torchlight of his killer wit into all the most embarrassing areas of contemporary Irish life. No-one is safe. If the truly serious are those who see the world for the joke it is, John Corless is one of the most serious poets we have. He is also a great performer of his own poems, one of the brightest rising stars of the live poetry scene. If you get the chance to go and see him read, do. Desperate Housewives will be repeated. John Corless may not." "John Corless comes to poetry with an infectious enthusiasm. He has imbued his work with a sense of discovery and wonder. His debut collection is gritty and irreverent, infected with copious amounts of tongue-in-cheek humour. Here you will find fake tan and calf nuts, the PDs, dancehall fights and dry cash hid behind dressers by dead bachelors. This is not a naive nostalgic sojourn through rural Connaught but an uncompromising white knuckle ride through sometimes dark and menacing places where sacred cows are put through their paces before being loaded up in a trailer and driven unceremoniously out to grass. You have been warned." John Corless lives and writes in County Mayo, Ireland. His poetry is a mix of political, satirical and rural and has been described as 'Paul Durcan meets The Sawdoctors.' He has an MA in Creative Writing from Lancaster University (2008) and is currently researching for a PhD. He writes poetry, fiction and drama. His work has been published in magazines and collections worldwide. He teaches creative writing in the Castlebar campus of GMIT (Galway Mayo Institute of Technology). This is his first collection. You spent years going to dances. when he heard about you after Mass. Her land was next to yours. stretched in the cottage for over a week. a picture of Big Tom on the mantelpiece. The first of two days on publications from Ireland's Salmon Poetry. First up, John Corless, who is the kind of man next to whom you wouldn't wish to be sitting if you were trying to balance something precious on your nose, or hoping to concentrate on your navel. He is funny, cubed, and like many of his compatriots, as droll as you might hope to find. I spent seven consecutive breakfasts with him one week, and starting the day off with a dose of laughter is better than prunes any day. So I admit to warming to his poems after just seeing his name emblazoned on the cover. I may have the advantage on you. We found them in the strangest places -/ blue twenty-pound notes -/ in cups on the dresser,/ in westerns with big print,/ and a bundle in the freezer./ Fifty-two of them; stashed carefully/ just in case we needed anything. And I won't spoil it for you by quoting the best two poems. The first is couched as a letter from a hospital to possible cancer sufferers who might or might not have had a test, and might or might not want to know that the results might or might not have been correct. the other one is the last poem, in which a congregation is discovered at mass, thinking not of the holy rites, but of the bargain hairdryers in Aldi's imminent sale, except to say that it contains a brilliant touch in which the bald priest's words are said to go 'over the heads of the congregation'. I laughed out loud the first time I saw this poem, and I laughed aloud when I read it again, and I laughed aloud when I looked at it again just now. This is a great collection - 12 very bargain euros. Invest early for Christmas. If you only buy one book this year, make sure it's Are you ready? 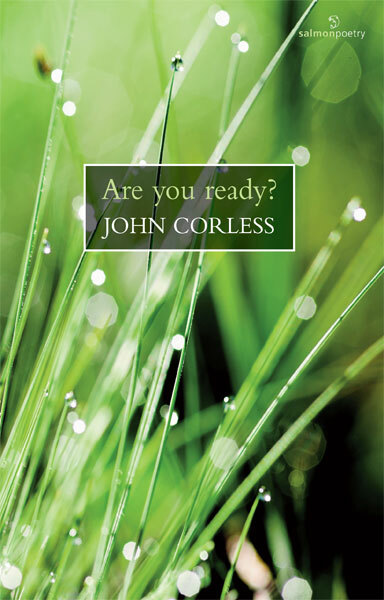 - a satirical and humorous collection of poetry by the one-and-only John Corless. The Claremorris man who also writes drama and fiction and teaches creative writing in GMIT, has just launched his debut collection and his poems are certainly far removed from those we learned at school. John's poetry is a mix of political, satirical, ecclesiastical and rural and has been described as Paul Durcan meets The Sawdoctors. He has an MA in Creative Writing from Lancaster University (2008) and is currently researching a PhD. John's work has been published in magazines and collections worldwide... mind you, some of his poems have been referred to the Attorney General for approval! Are you ready? contains a total of 46 poems, some just a few lines long and some that go on for pages. But, lest one would think that John's poems are like those by another author, rest assured that you definitely won't be bored reading this book. Side-splitting humour and tongue-in-cheek commentary are synonymous with John's poetry. And, when it comes to putting pen to paper, John clearly doesn't hold backk. On Friday night in Claremorris, John had a packed audience falling off their seats with laughter as he read from his book for the formal launch. Are you ready? is a fantastic collection of poetry by the Claremorris man but, be warned, it may not be everybody's cup of tea!